1700: born in Ôsaka. He get married with the daughter of Yamamoto Hikogorô, originally a kyôgen actor who became a Kabuki actor. He was adopted by his father-in-law and received the name of Yamamoto Hachiroemon. Later on, he took the name of Yamamoto Kôshirô. 11th lunar month of 1724: Kôshirô performed in Kyôto as a jitsuaku in the kaomise drama "Ôjigawa Kogane no Mizuguruma". 11th lunar month of 1725: he became zamoto in Ôsaka and took the name of Yamamoto Kyôshirô I , producing at the Naka no Shibai the kaomise drama "Hôraisan Imose no Matsu", which celebrated the shûmei of Nakamura Shirogorô II and Yamashita Kamenojô II. 11th lunar month of 1727: Kyôshirô produced at the Naka no Shibai the kaomise drama "Imosegami Aioi no Futabayama". 9th lunar month of 1728: last production as zamoto; Kyôshirô produced at the Naka no Shibai the drama "Aioi Makura Kanae Otoko". 1st lunar month of 1729: Kyôshirô and his father Yamamoto Hikogorô went together to Edo; they performed at the Moritaza in the drama "Higashiyama Chôseiden". 11th lunar month of 1729: Kyôshirô played at the Moritaza the role of Kamei Rokurô in the kaomise drama "Yahagi no Chôja Kogane no Ishizue". Fall 1730: Kyôshirô went back to Ôsaka. 11th lunar month of 1730: Kyôshirô played at the Kado no Shibai the role of Nakatsugawa Jôsuke in the kaomise drama "Matsukane Fukki no Ishizue". Fall 1739: Kyôshirô went to Edo. 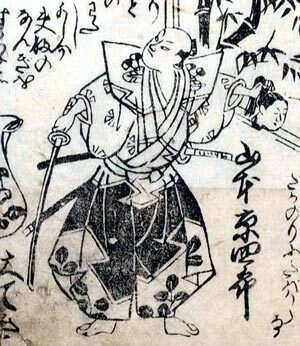 11th lunar month of 1739: Kyôshirô played at the Nakamuraza the role of Sano Gentôta in the kaomise drama "Miyakozome Kaoru Hachinoki"; his stage partners were Sawamura Sôjûrô I, Ichikawa Danzô I, Nakamura Shichisaburô II, Segawa Kikujirô I and Nakamura Sukegorô I. Fall 1740: Kyôshirô went back to Ôsaka. 11th lunar month of 1740: Kyôshirô played at the Ônishi no Shibai the role of Tachibana Chikaranosuke in the kaomise drama "Yaguruma Yakata no Fuji"; his stage partners were Segawa Kikunojô I, Nakamura Shingorô I, Nakayama Shinkurô I, Sanogawa Mangiku, Onoe Kikugorô I, Nakamura Sôjûrô and Arashi Shichigorô I. 1st lunar month of 1741: Kyôshirô's rank in the Ôsaka hyôbanki, tachiyaku section, was jô-jô-kichi (superior - superior - excellent). 11th lunar month of 1741: Kyôshirô played at the Ônishi no Shibai in the kaomise drama "Bankoku Taiheiki", which welcomed in Ôsaka the Edo actors Ichikawa Ebizô II and Ichikawa Danjûrô III. It included the "Uirô Uri" scene and was produced by Sadoshima Chôgorô I. 12th lunar month of 1741: Kyôshirô played in the same theater the role of Kudô Saemon Suketsune in the drama "Yamato Ikioi Soga"; his stage partners were Ichikawa Ebizô II (Soga Gorô Tokimune, Soga Jûrô Sukenari) and Onoe Kikugorô I (the courtesan Kewaizaka no Shôshô). 1st lunar month of 1742: Kyôshirô played in the same theater the role of Hayashi Dennai in the drama "Narukami Fudô Kitayama Zakura" [casting]. The performance was a triumphant success and was extended up to the beginning of 7th lunar month of 1742. Fall 1746: Kyôshirô went to Edo. 11th lunar month of 1746: Kyôshirô played at the Ichimuraza the role of Oniô Shôji Saemon in the kaomise drama "Aioi Izu Nikki". 3rd lunar month of 1747: the play "Sugawara Denju Tenarai Kagami" was performed for the first time in Edo, at the Ichimuraza; Kyôshirô played the role of Shiratayû [casting]. 11th lunar month of 1747: Kyôshirô played at the Ichimuraza the role of Hasebe Chôbê in the kaomise drama "Shusse Momijigari". 11th lunar month of 1748: Kyôshirô moved to the Moritaza, became zagashira and played in the kaomise drama "Fuyu Botan Yoshino Dairi", which celebrated the shûmei of Azuma Tôzô II. 2nd lunar month of 1749: the play "Kanadehon Chûshingura" was staged for the first time in Edo, at the Moritaza; Kyôshirô played the role of Ôboshi Yuranosuke. 11th lunar month of 1749: Kyôshirô played at the Moritaza in Tsuuchi Jihê II's kaomise drama "Bijo Kurabe Kiso no Kakehashi", which celebrated the shûmei of Sawamura Sôjûrô II. 4th lunar month of 1750: the play "Sugawara Denju Tenarai Kagami" was produced at the Moritaza for the first time; Kyôshirô played the role of Takebe Genzô [casting]. Fall 1751: Kyôshirô went to Kyôto. 11th lunar month of 1751: Kyôshirô played in Kyôto in the kaomise drama "Kaeribana Shinohara Gunki". Fall 1752: Kyôshirô went back to Ôsaka. 11th lunar month of 1752: Kyôshirô played at the Ônishi no Shibai the role of Wakanoura Ôkura in the kaomise drama "Kyô Miyage Matsuri Zoroe"; his stage partners were Wakayama Shinkurô, Wakayama Bunshichi, Ôtani Hirohachi I, Iwata Somematsu I, Matsushima Kiyosaki, Ichimura Sanohachi, Kirishima Gizaemon, Kiriyama Monji I, Matsushima Moheiji, Takenaka Heikichi, Murayama Heijûrô IV and Nakamura Shirogorô III. 1st lunar month of 1756: Kyôshirô was the kanjiku for tachiyaku actors in the Ôsaka hyôbanki. 11th lunar month of 1758: Kyôshirô played at the Naka no Shibai the role of Sakata Kintoki in the kaomise drama "Shitennô Chikara Kurabe"; his stage partners were Ichikawa Danzô III, Yamashita Matatarô I, Ichinokawa Hikoshirô II, Yoshizawa Sakinosuke II, Nakamura Kumetarô I and the zamoto Arashi Kichisaburô I. 1st lunar month of 1759: Kyôshirô's rank in the Ôsaka hyôbanki, "Kurokichi Shitennô" section ("the big four with the excellent character written in black"), was jô-jô-kichi (superior - superior - excellent). The 3 others actors, who belonged to this "big four" section, were Ichikawa Danzô III, Yamashita Matatarô I and Nakayama Shinkurô I. 11th lunar month of 1760: Kyôshirô played at the Naka no Shibai the role of Miura no Ôsuke in the kaomise drama "Miura no Ôsuke Toshitoku Môde", which was produced by Anegawa Shinshirô II. 6th lunar month of 1761: Kyôshirô played in the same theater the role of Tsuribune Sabu in the drama "Natsu Matsuri Naniwa Kagami"; the roles of Danshichi Kurobê and Issun Tokubê were played by Fujikawa Heikurô and Fujikawa Hachizô I. The former actor suddenly fell ill and had to replaced by the latter. Fall 1761: Kyôshirô moved to Kyôto. 11th lunar month of 1761: Kyôshirô played at the Minamigawa no Shibai the role of Hasebe Hyôgonoshin in the kaomise drama "Hitomaru Banzei no Utena", which was produced by Sawamura Kunitarô I. 11th lunar month of 1762: Kyôshirô played at the Minamigawa no Shibai in the kaomise drama "Tenka Taihei Kogane no Kurairi", which was produced by Onoe Montarô and Sawamura Kunitarô I. 3rd lunar month of 1763: Kyôshirô played in the same theater the roles of Ôboshi Yuranosuke and Amakawaya Gihei in the drama "Kanadehon Chûshingura". 11th lunar month of 1763: Kyôshirô played at the Kitagawa no Shibai in the kaomise drama "Shôchikubai Ôshimadai". 1st lunar month of 1764: Kyôshirô was the kanjiku for tachiyaku actors in the Kyôto hyôbanki. Fall 1764: Kyôshirô went to Edo but he suddenly fell ill.
20th day of the 10th lunar month of 1764 : Kyôshirô died in Edo; his tombstone was located in the precincts of the Jôshinji temple in Edo in the district of Fukagawa. Yamamoto Kyôshirô I was a leading Ôsaka actor, who achieved fame for himself from the end of the Kyôhô era to the Hôreki era not only in Kamigata but also in Edo where he made several successful stays. He was able to play a wide range of male roles as a tachiyaku, jitsuaku, oyajigata (in his latter years) or aragotoshi. Budôgoto roles in jidaimono dramas were his forte. His most notable performance was Ôboshi Yuranosuke in "Kanadehon Chûshingura". He perfectly delivered his lines with a great kôseki. Was there any Yamamoto Kyôshirô II? The question is still open. In "Kabuki Jinmei Jiten", Yamamoto Kyôshirô II was recorded as a Kamigata actor, who settled in Edo in Fall 1795 and performed at the Miyakoza from the 11th lunar month of 1795 to the 7th lunar month of 1797. We've checked in the 1797 Edo hyôbanki and we've found only an actor named Kataoka Kyôshirô, a disciple of Kataoka Nizaemon VII. The 20th day of the 10th lunar month of the 1st year of the Meiwa era was the 13th of November 1764 in the western calendar.